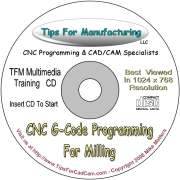 Welcome - Tips For Manufacturing brings you professional training tools to learn about Mastercam , G-Code Programming & Anilam CNC Control Systems. Learn by seeing, then by doing, when you follow the examples provided in these comprehensive tutorials. The Tips For Manufacturing training tools were developed by a veteran machinist, CNC programmer and teacher. These tools will teach you a logical procedure for all of your everyday programming and design problems. Watch these lessons in high resolution video with audio narration. Most are on CDROM and can be watched on your PC, while others are DVD format. It's the perfect way to learn and practice without ever leaving your chair. Get up to 18% off when you buy any combination of 6 CD’s.